Oscar winner Dustin Hoffman (Rain Man, Midnight Cowboy) teams up with Oscar winner Kathy Bates (Misery, Titanic, Midnight in Paris) along with the rarely seen actress Debra Winger (Shadowlands, The Sheltering Sky) in a heart warming tale of an 11 year old boy Stet, superbly played by Garrett Wareing who after the death of his young mother and abandonment of his cold hearted father Gerard, played by Josh Lucas (A Beautiful Mind, The Lincoln Lawyer) is sent to an exceptionally Boychoir school to study singing, an American version of the Drakensberg Boys Choir set in Connecticut on the East Coast. Hoffman plays the hard edged choir master Carvelle who recognizes the shimmering talent in Stet and soon after a series of missteps, casts him as the solo lead in a Choir Concert by Handel that the travelling Boychoir is performing in in New York city. French Canadian director Francois Girard’s (Silk, The Red Violin) nuanced film Boychoir which premiered at the 36th Durban International Film Festival DIFF is an absolute treat of a film and will be highly appreciated by audiences that enjoy beautiful music and singing of an elusive scale. Boychoir is a scaled down version of Dead Poets Society, a brilliant portrait of one man, Carvelle who is desperate to catch the singing talent that these boys have before they reach puberty and of a boy, Stet, who struggles to survive in a hostile yet ultimately rewarding environment who eventually wins back the affection of his estranged father. 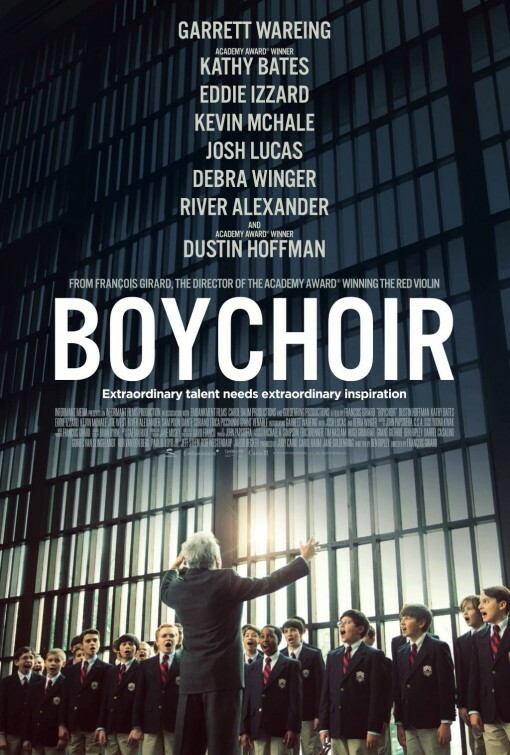 Boychoir also stars Eddie Izzard (Valkyrie, Ocean’s Thirteen) and Kevin McHale from the hit TV series Glee and is a highly recommended film sure to warm any viewer’s perceptions of a child prodigy struggling against endless adversity.